In a previous post, I discussed how the introduction of the automobile also introduced a bunch of new ways for people to hurt themselves. Similarly, an injury known as ice hockey lung didn't exist until a key advance was made in the world of ice sports: motorized ice resurfacing machines. Otherwise known as Zambonis (the same way Kleenex is a catch-all term for different brands of tissue paper), they were developed in the 1940s as a means of quickly and efficiently restoring ice sheets carved up by skate blades. 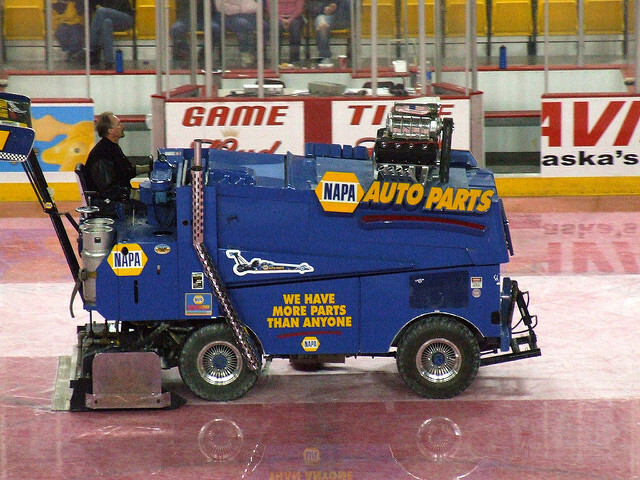 Although electric ice resurfacers are now a thing, they've traditionally been powered by some sort of internal combustion engine. Within a hot engine, nitrogen gas and oxygen gas from the atmosphere can react via a two step process to produce a reddish-brown and highly corrosive gas called nitrogen dioxide. In the absence of adequate ventilation and/or the presence of a malfunctioning ice resurfacer engine, the gas can appreciably accumulate inside indoor ice rinks and injure people who breathe it in. When you inhale it, nitrogen dioxide is able to travel into the deepest recesses of your lungs. Here, it reacts with water to produce nitric acid. The acid eats away at nearby lung tissue (e.g. alveoli), causing inflammation (pneumonitis) and the accumulation of fluid (edema). People will typically develop breathing difficulties and a cough (which can bring up blood). Annoyingly, the negative effects of inhaling nitrogen dioxide sometimes don't show up until a day or two after exposure. Treatment options include giving high doses of corticosteroids to reduce inflammation. Perhaps unsurprisingly, ice hockey lung tends to affect hockey players, with cases having been reported in North America and Europe. Other illnesses caused by breathing in a lot of nitrogen dioxide include silo-filler's disease and numismatist’s pneumonitis. Karlson-Stiber C, Höjer J, Sjöholm A, Bluhm G, Salmonson H. 1996. Nitrogen dioxide pneumonitis in ice hockey players. Journal of Internal Medicine 239(5):451-456.